My name is Adrian and I am incredibly honoured to be chosen to be the Honorary Chair for London’s 2019 Gutsy Walk. Like many of you, I suffer from IBD, which I was diagnosed with when I was 16 years old. Unfortunately, after battling this disease for almost 8 years, I underwent surgery in late 2017 and now live with what’s known as a J-Pouch. 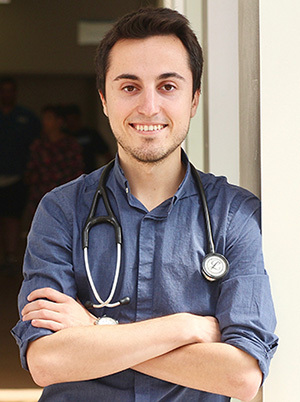 My difficult experience with IBD inspired me to pursue a career as a gastroenterologist so that I can aid in the search for a cause and a cure, and this has led me to Western University where I am currently a senior medical student. Every year we make great strides in this fight, but we can’t do it alone; we need each and every person’s help if we are going to win the battle. The Gutsy Walk is fundamental to supporting important research and those living with this condition. That’s why I’m walking this year, and I hope everyone can join us too – together we can make it stop!